A deep venous thrombosis (DVT) is a blood clot (thrombus) that forms inside deep veins in your legs or pelvis. The clot blocks blood flow and causes pressure to build up in the vein. Part of the clot can break away and move through your bloodstream to your lungs. 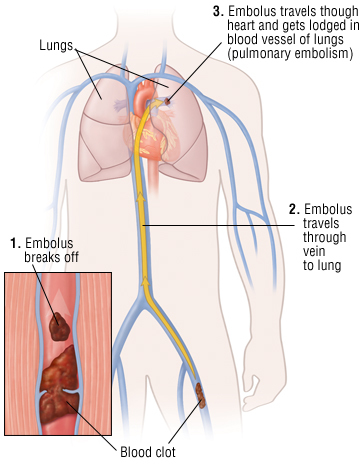 If the clot blocks one or more of the blood vessels in your lungs, it is called a pulmonary embolism. DVT is a common problem. Most of these clots occur when blood flow in the veins of the legs is slowed. This is usually as a result of inactivity.